Anyone who is everyone can dye something with tea. Its so simple and the effect it gives your garment is really wonderful. I decided my little cream-and-lace tank needed a vintage makeover! Here is what I did, step by step. 1) Fill a large pot 3/4 full with water. Set on low heat (you don't want it to boil) and let it warm up. 2) (Optional) Tie your garment into sections. 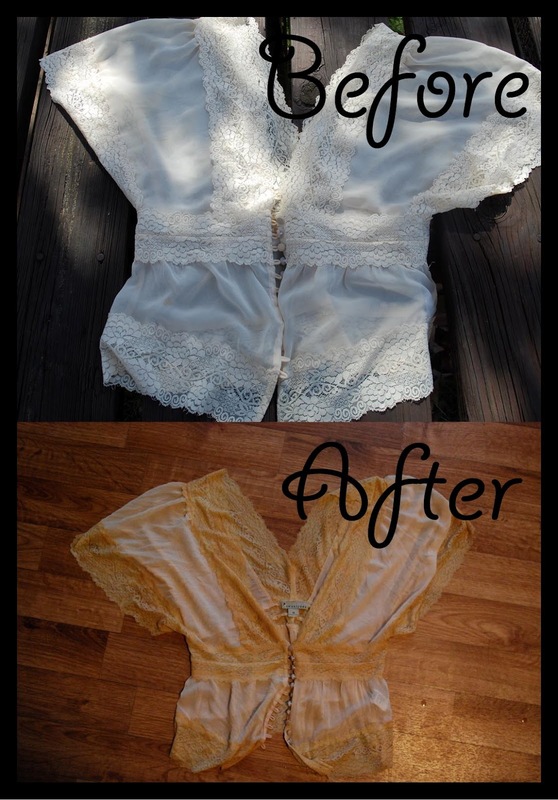 This will "fade" the aging effect (making it look even more vintage) If you don't tie it up the color will not fluctuate as much, and will be a more over all sepia when finished. 4) Let the tea sit for 5-10 minutes. Then squeeze all the tea out of your bags, making sure not to burn yourself! Make sure to lay it flat to dry (if you hang it before drying, the color might run downward).